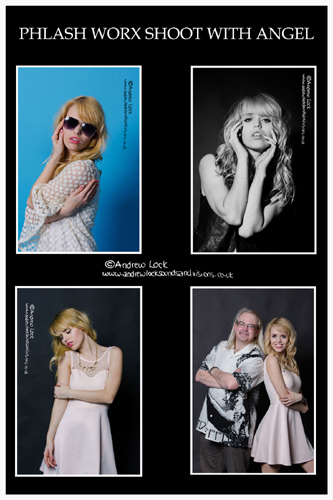 Still working hard to try and gain confidence and skills in the portrait/studio side of my photography and to this end had my latest model shoot at Phlash Worx here in Leamington Spa on Friday 13th February. Decided this time to take a two hour slot and the model was the delightful Angel, a joy to photograph and with her being a photographer herself she also gave my a good few tips along the way and as with the models at my previous sessions at Phlash she was friendly, great fun and helped me overcome my nerves. The longer running time gave us chance to do quite a few outfit changes as well as lighting/background set ups and she even gave herself a rock chic look to make me feel right at home, she is certainly a model I would like to work with again (when I really know what I am doing that is !! ).